The King and Queen of Spain landed at East Cowes from their yacht the Giralda yesterday morning, and, entering their motor-car, proceeded to West Cowes, to do some shopping. Later His Majesty visited the Isle of Wight Gun Club. On the occasion of his stay in the island in May last King Alfonso shot at the Gun Club with considerable success as a visitor, and succeeded in winning one sweepstake and dividing another. After the meeting he expressed a desire to become a member, and promised that when he returned in August he would take part in a competition. 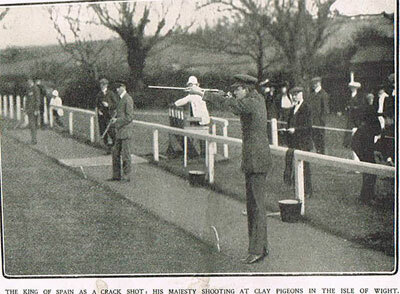 Accordingly His Majesty motored from Osborne Cottage to the shooting ground, which is situated in a most picturesque spot at Ashey, near Ryde, and spent the afternoon contesting for a handsome cup, which was shot for by members of the club in open competition, without handicap. The shooting was extremely keen, and towards the end became most exciting. The King was accompanied by Princes Leopold and Maurice of Battenberg, and attended by Mr Thomas Cochrane, Deputy-Governor of the Isle of Wight, whilst amongst those present were Lady Adela Cochrane, Mrs Howard Brooke, Mrs Basil Duncombe, Mrs Hamilton, Mrs Heckstall-Smith, Mrs Rhodes, Mrs Blair Cochrane, Miss Alexander, and a number of members of the club. 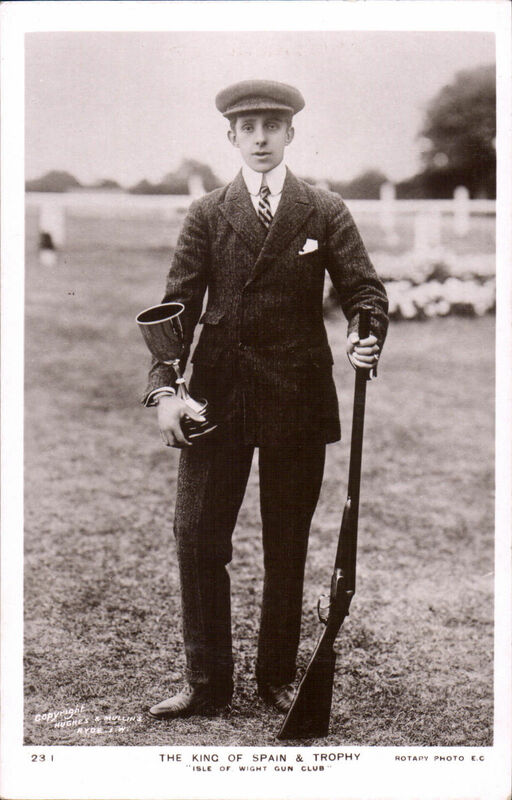 King Alfonso, who broke most of his birds very clean with his first barrel, therefore won the cup, which was presented to him by Mrs Howard Brooke, wife of the master of the Isle of Wight Foxhounds, and his Majesty expressed himself much pleased with the success of the afternoon’s sport. Princess Henry of Battenberg gave a farewell dinner party in the evening, the guests including the King and Queen of Spain, and Prince and Princess Alexander of Teck, who had arrived at Osborne Cottage earlier in the day. King Alfonso and Queen Victoria leave for Spain after lunch today.